The Colt Model 1848 Percussion Army Revolver is a .44 caliber revolver designed by Samuel Colt for the U.S. Army's Regiment of Mounted Rifles. The revolver was also issued to the Army's "Dragoon" Regiments. This revolver was designed as a solution to numerous problems encountered with the Colt Walker. Although it was introduced after the Mexican–American War, it became popular among civilians during the 1850s and 1860s, and was also used during the American Civil War. The Colt Dragoon Revolver was produced with several variations between 1847 and 1860, when the Colt Model 1860 revolver replaced it. All the improvements in design of Colt revolvers were applied to the Dragoons as well to the smaller models of Colt revolvers. Total production of Colt Dragoons including the 1,100 Walkers, from 1847 to 1860: 19,800; plus 750 Dragoons in a separate number range for the British market. For collectors, there are three different types with one "transition" model. Between the Walker and the First model Dragoon, around 240 improved models were produced, barrel length 7 1/2 inch, cylinder 2 3/16 inch. Their general appearance was to that of the production Dragoon models. These were produced between late in 1847 and 1848, serial number range approximately 1100 (the last civilian Walker) through about 1340 (the first Dragoon First Model). These are sometimes called "Transition Walker" revolvers, and were made in two frame variations. The earlier pattern was a Walker carry-over with a cut-out in the back to accommodate the round contour of the grips and the second was straight-backed. Another distinctive detail were the very slender "Slim Jim" grips. Note: Due to serial number gaps between the "Transition" model and the First Dragoon, of which Colt later "backfilled", as well as the details of the production and delivery of the Second Government Contract, The "fluck Dragoon" was erroneously derived. The First Model Colt Dragoon Revolver production began in 1848, stemming from Colt's Second Government Contract. It has oval cylinder stops, a V-type mainspring, no wheel on the rear of the hammer, and a square back trigger guard. Colt produced about 7,000 first models between 1848 and 1850. The Second Model has rectangular cylinder notches. Until the no. 10,000 the V-shaped mainspring was standard and then replaced with a flat leaf mainspring and a wheel on the hammer at its bearing on the mainspring. All the Second Model Dragoons have the squareback trigger guard. The company made about 2,550 Second Models in 1850 and '51. The Third Model Dragoon numbers stand at ten-thousand from 1851 through 1860. This design had more variations as compared to its earlier counterparts. Some of the third model Colt Dragoon Revolvers had frame cuts for detachable shoulder stocks, horizontal loading lever latches and folding leaf sights. Third Colt Dragoon Revolvers had a round trigger guard. Government records showed an order for 8,390 Dragoons. Other variants included the Colt "1848 Pocket Pistol" now known as the Baby Dragoon, marketed in California with success during the Gold Rush days. With the addition of a loading lever this evolved into the 1849 pocket revolver (see Colt Pocket Percussion Revolvers). The Dragoon was produced because of the problems seen with the fielded Colt Walker revolvers, namely, the Walker's heavy weight, four and a half pounds, making it suitable only for use as a saddle-mounted revolver, the Walker's propensity for cylinders exploding on occasion when fired (due to the chambers being loaded with too much powder), and the Walker's habit of dropping the loading lever upon discharge, locking up the revolver action in the middle of combat. The Colt Dragoon Revolver had a comparatively shorter cylinder (thus preventing overloading the cylinder) and held up to 50 grains of powder, whereas the Walker had used up to 60 grains of powder. The Dragoon Revolver had a shorter barrel at 7.5 inches (some later revolvers 8 inches) as compared to the 9 inches (230 mm) barrel on the Walker. A loading lever latch in front of the lever replaced the spring to keep the lever from dropping during recoil, thereby preventing jamming of the revolver. These variations made the Colt Dragoon Revolver 4 pounds two ounces. These changes also reduced the risks of the Colt Dragoon Revolver from exploding when fired, unlike the risk that had been demonstrated with the Walker revolvers. In the troublesome events that led to the Civil War, Colt Dragoons became extremely popular. In the beginning Colt Dragoon Revolvers were issued for the U.S. Army's Mounted Rifles. They were carried in pommel holsters on the saddle. The Colt Dragoon Revolver gained popularity among civilians in the Southwest where many had served in the Mexican–American War. The Dragoon became a master weapon for civilians who hailed it as a powerful weapon of the time. Famous users included Joaquin Murietta, the California bandit, Charley Parkhurst, California teamster, James Douglas Byrd, Town Marshal, Watsonville, California, 1868, Tiburcio Vasquez, Union general George B McClellan, and fictional Augustus McCrae, in the novel Lonesome Dove, Mattie Ross in the novel True Grit and in the 2010 film version (the 1969 film of that name had Mattie Ross using a Colt Walker revolver, though John Wayne's character Rooster referred to it as a Colt's Dragoon). Charley Parkhurst, while driving freight, was confronted by two bandits whom he dispatched with the Colt Holster Pistol. According to Harper's Weekly, James Butler (Wild Bill) Hickok arrived in Springfield, Missouri carrying a Dragoon though it is generally accepted that he used a Navy in his street duel with Davis Tutt. The Dragoon is now a collectible arm and sells for high prices. Non-firing replicas of the Colt 1848 Dragoon were manufactured at Denix in Spain. In 2005, a fire burned down the factory and destroyed the mold for the gun, which has since gone out of production. Denix has since reintroduced the non-firing model of the Colt 1848 Dragoon in Nickel. Quality Replica Dragoons are currently produced by the Aldo Uberti Company of Brescia, Italy and distributed in the United States by Taylors, Inc.; Cimarron Firearms, and others. They are quite accurate and potentially more powerful than the belt sized revolvers of the same bore diameter. Velocities with .451–457-inch round balls of approximately 141 grains over the full 50 grains of powder frequently show chronographed readings in the 1,000 to 1,100 foot per second range depending upon the powder used. 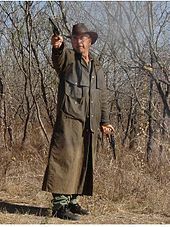 A cartridge-converted Colt Walker instead of the Colt Dragoon in the book was used in the 1969 film True Grit, as the weapon carried by 14-year-old Mattie, possibly due to the Walker's larger size. The Dragoon was used in the 2010 Coen Bros. movie as in the original book. ^ a b c d e Rick Sapp (2007). Standard Catalog of Colt Firearms. F+W Media, Inc. pp. 35–40. ISBN 978-0-89689-534-8. ^ "True Grit (1969)". Internet Movie Firearms Database. Retrieved 15 May 2015. 4. Flack, Jeremy Rifles and Pistols Florida:Sunburst Books, 1995.